MOTIVATED SELLER, MAKE OFFER. This beautiful home & 20.6 acres in Ralls Co creates the perfect setting for a residence, recreational retreat or weekend getaway! It features a 896 sq ft guest house above a 3 car garage could also be used as a rental home, 24x26 metal garage,35x40 barn & carport. Main home has 3550 sq ft of living space. Main level consists of a living room w/ a gorgeous wb fireplace & crown molding, kitchen, large MBR w/ his/her closets, bedroom, 2 baths, laundry room & screened in back porch. LL is fully finished w/ a game room, family room, 2 bedrooms, office, bathroom & storage area. Guest home features a kitchen, bedroom, living room, bathroom & laundry room. 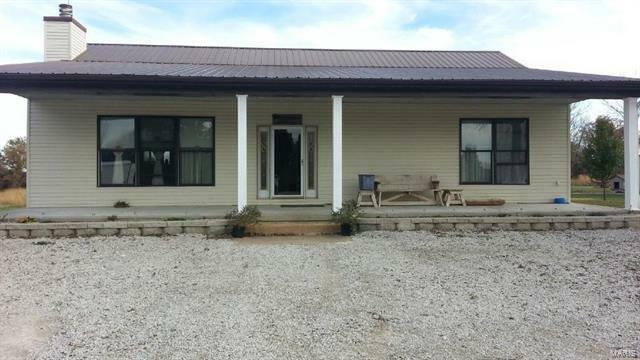 Acreage consists of 3 acres woods with oak & hickory timber. Remaining acreage is open ground currently used as yard, garden area & 10 acre hay production. Hay production ground could make an excellent spot for a large food plot. Excellent hunting & fishing opportunities are just down the rd at Mark Twain Lake.